If you’ve seen “Taxi Driver,” then you know the profoundly depraved sense of alienation that Paul Schrader is capable of bringing to a screenplay. If you’ve followed the writer and sometime director’s more recent work, then you also know he hasn’t made a remotely comparable grab for cineastes’ attention in an awfully long time — not since the Nick Nolte showcase “Affliction” more than two decades ago. 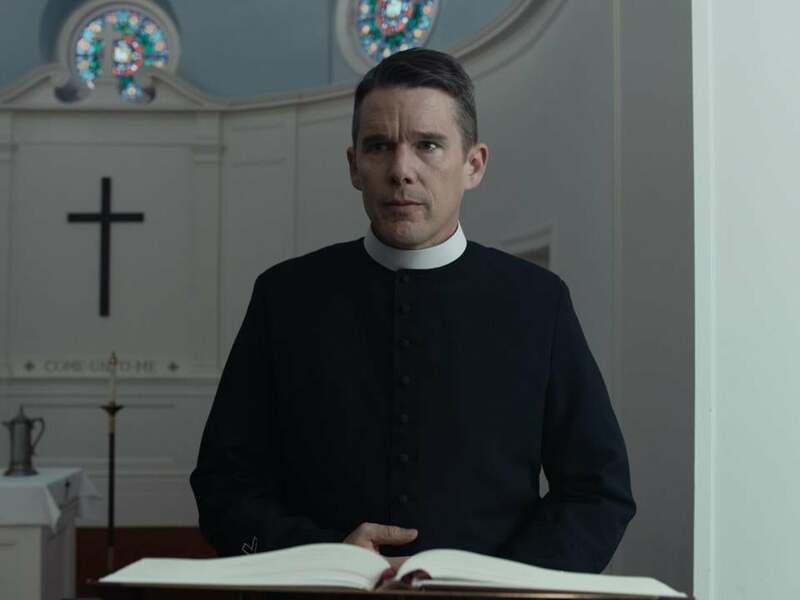 Schrader strives to reassert his relevance with “First Reformed,” a somber, harrowing drama about a small-town pastor (Ethan Hawke) grappling with faith, loss, even the imminent fate of our planet. As the weight of it all swallows him like quicksand, Hawke’s character plays like cabbie Travis Bickle recast as someone more civilized, a man of the cloth. (He even speaks in diary-reading voice-over.) Not that the film is on a level with Scorsese and De Niro, but its ambition is encouraging, and its dark musings are certainly provocative. Hawke delivers a strong melancholy variation on his familiar emotional cool as Reverend Toller, a former military chaplain now ministering to a handful of congregants at a faded antique church in upstate New York. It’s a mundane assignment but a sensible fit given some worrisome health issues he’s experiencing, not to mention the guilt he quietly, boozily compartmentalizes over the loss of his son. When pregnant parishioner Mary (an uneven Amanda Seyfried) asks Toller to counsel her troubled environmentalist husband, Michael (Philip Ettinger), the pastor dutifully comes calling, only to be drawn into ethical debate over bringing new life into a fast-sinking world. (The scene is preachy — on both sides — but it plays.) The tragedy that subsequently strikes the young couple only makes Toller more determined to help, and progressively more attuned to Michael’s radical cause. All innocuously clerical enough, until Toller’s disgust with a ministry-underwriting, EPA-flouting local industrialist (Michael Gaston) turns as malignant as whatever’s necessitating those whiskey-and-Pepto cocktails. Written and directed by Paul Schrader. Starring Ethan Hawke, Amanda Seyfried, Cedric Antonio Kyles. At Boston Common, Coolidge Corner, Kendall Square. 108 minutes. R (some disturbing violent images).